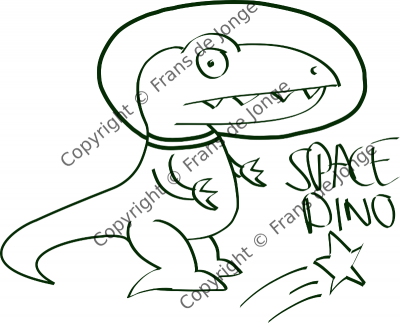 Late April 2009—I just realized that’s not as long ago as it feels—I drew Space Dino, purely for personal reasons. I wanted to give a shirt as a gift, and I also wanted to wear a shirt with a design by yours truly on it. 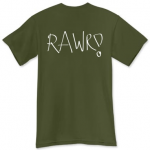 I put it on PrintFection because if I got one female’s shirt, one dark green male shirt and one white shirt, the white shirt would cost practically nothing. The prices were slightly cheaper back then, as I recall. 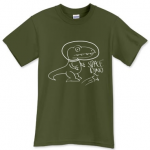 All three t-shirts I bought—one female, two male—ended up really nice. 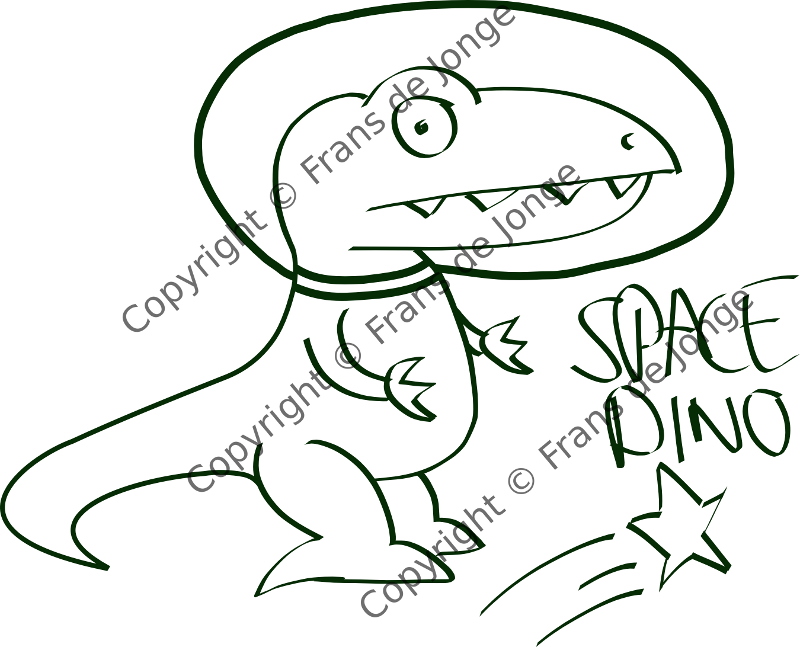 I never posted Space Dino on this weblog, so I figured I should remedy that. After all, it’s the best place to collect some of my thoughts and creations in one place. I also have all of my image files backed up on several hard disks, but that’s almost entirely without context. This context already gave me a pleasant surprise. As it turns out, I’ve always liked the idea of creatures wearing some kind of space or diving gear. I completely forgot about the fish walking the land I drew over three years ago, but I just ran into it when I was looking through the Drawing category on this very site. To accompany the “official” release of this drawing, I wrote a little introductory poem. I wanted to experiment with meter, so I started out with a four line iambic pentameter with an abab rhyme scheme. However, that turned out as boring as 12th century poetry. After some revamping, I ended up with something that hopefully isn’t half as bad. So without further ado, I give you the Space Dino poem, which explains the origin of space dinos. Just to annoy you with technicalities, I decided to include a version with the stresses clearly marked. to the space- | age di | nokind. I should probably mention that this post was inspired by one of Wil Wheaton’s rants about being creative with barely any risk. If anyone wants to obtain a copy of this shirt, I guess they should banter me by mail or in the comments to this entry. I guess I could always open the PrintFection store again, but since I would want a buck or two of the profits—that’s only fair, right?—and they only hand out American commission checks as far as I can tell, I don’t even know if I could even do anything with that over here.